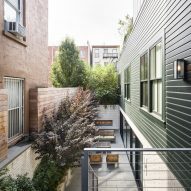 New York studio Fogarty Finger has converted a defunct industrial building in New Jersey into a single-family home, adding a volume on the roof and converting the basement into liveable space. 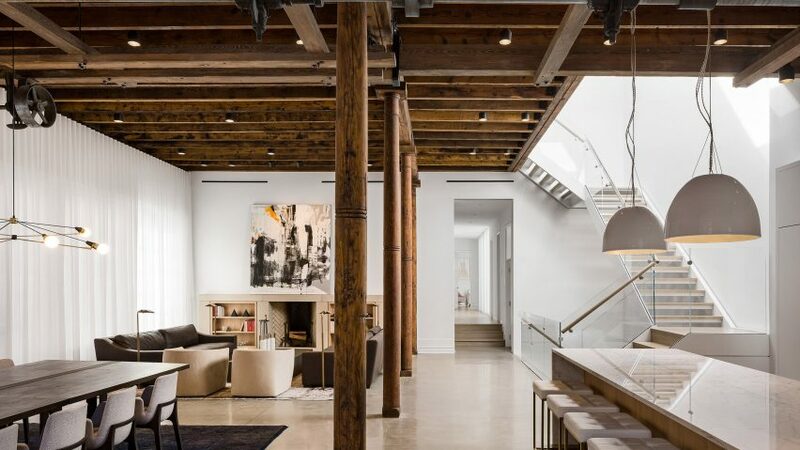 The Paulus Hook Residence is located in the historic district of the same name, a short distance away from Downtown Manhattan by ferry or rail. 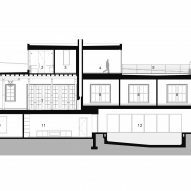 The architects wanted to preserve the original character of the factory, which previously housed a workshop for Alexander Thomson & Sons Pattern Makers – a company that made wooden forms that were then cast in metal for propellers. "The architectural design aimed to convert the historic propeller-pattern factory into a modern home, while also restoring the classic details," said a statement from Fogarty Finger. 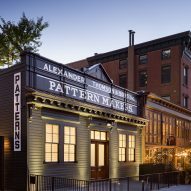 The architects returned the facade to its original state, giving it the appearance of an industrial storefront. 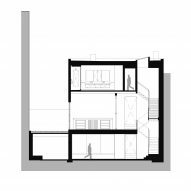 Entrance from the street is through a vestibule that leads into the central living space. This area includes the home's kitchen, living, and dining rooms, which are set within the main factory floor. 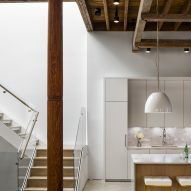 "The architects preserved the original wood joists, wood columns, concrete floors and machinery from the building's industrial past and incorporated them into the main living space," said the statement. 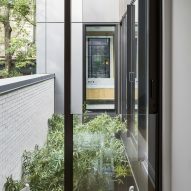 Large glass doors allow the living room to open out to a courtyard that runs along the side of the home. 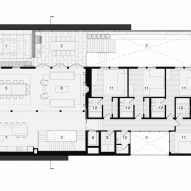 Four bedrooms, each with their own ensuite, are located along a corridor off the main living room. 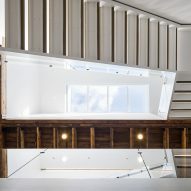 A white metal staircase with open wood treads leads up to the rooftop extension, which is reserved for the master suite. "The second-floor addition was designed to set back from the front facade and clad in zinc for a contemporary, yet minimal intervention from the exterior view," said the architects. Setting back the structure created two rooftop terraces on this level. The deck that faces the street is laid out with sun chairs, and is adjacent to the master bathroom. On the yard side, the architects created an outdoor living room, with couches and a fire pit. This acts as an extension of the master bedroom, which features floor-to-ceiling glass walls that slide open to expand the space. 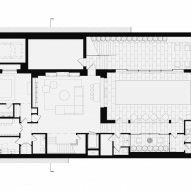 Other amenities within the master suite include a walk-through closet, powder room, and a study. Excavating the basement level also allowed the architects to create more space. This floor gets natural light from the courtyard along the side of the house, which extends down to this level. Here, a variety of facilities are laid out around the central family room. 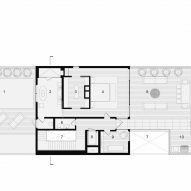 These include a pool, sauna, and steam room on one side, and a guest bedroom, secondary kitchen, and wine cellar on the other. 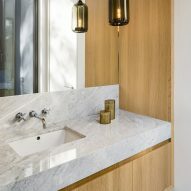 To contrast the industrial character of the restored spaces, the architects chose a palette of luxury materials that includes three varieties of marble, polished concrete floors, and white oak. "The design elements throughout the home incorporate a rich palette of natural wood and stone to celebrate the historic language of the building, while creating a new perspective for a modern family," said Fogarty Finger. Similar recent adaptive reuse projects that have given new life old buildings include SOM's conversion of a Chicago firehouse into a hat factory, and the transformation of a 120-year-old steam plant in Ohio into part of a new medical campus, by HKS. Photography is by Alexander Severin.